This chapter covers how to create a new event, describing each of the set up options available in the event creation screen. If you're going to allow online registration for the event, you will also want to read the online event registration chapter. If not, you'll want to read the manual event registration chapter. The first page you see when creating an event requests basic information online about the event. You can click on any of the blue question marks to show help for each of the fields. When you see a pencil, clicking on it will take you to a screen where you can edit the options available. Note, depending on your permissions, you may not be able to edit these options and therefore will not see the pencil. From template allows you to create an event from a template (see Event templates chapter in this section) rather than creating one from scratch. Event type allows you to categorise the event. If you have CiviCampaign enabled, you can select a campaign for this to be a part of (see the Campaign section for more details). Do you want users to see a list of participants, and how much information about the participants do you want to reveal? Participant Listings demonstrate support for an event and can help to generate interest within your constituent community. Note that the options you define in this section only enable participant listings — to display one, you will need to create a menu item or link to the listing somewhere on your website. 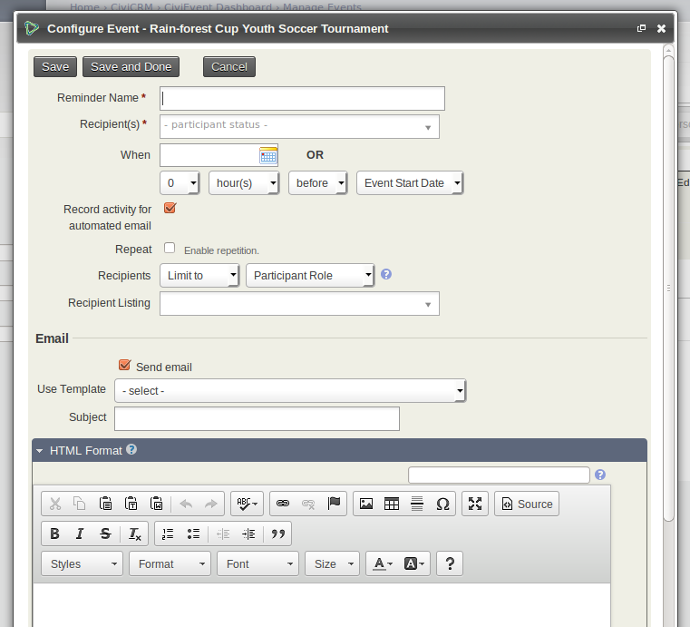 Once you've created the event, the participant listing link is displayed on the event configuration page. Refer to the chapter Event management for information on participant listings and other ways to promote your events. 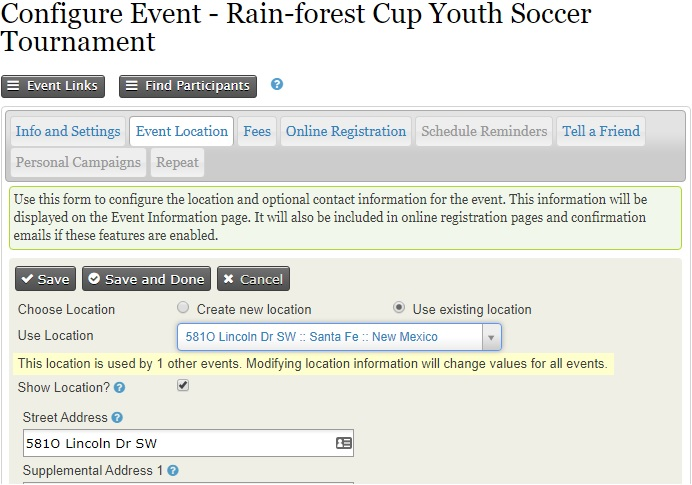 Once you have entered an event location, you can reuse it for subsequent events by clicking Use existing location and selecting it from the dropdown list. Note that if you choose an existing location and edit it, it will update that location for all events that use it. What Contribution Type (financial type) will be assigned to paid registrations for this event? Although the most common value for this field is simply Event Fee, CiviCRM provides the flexibility to define multiple Financial Types and assign them to different events as needed. See Set-Up in the Contributions section for details. If you plan to accept credit card payments through the online registration form, you need to configure a payment processor prior to creating your event. Find more information about this, see Payment Processors in the Contributions section. If your event requires a more complex pricing structure, with more options or additional add-ons, you may wish to use price sets or discounts. For more information about this, see the Complex event fees chapter in this section. CiviEvent makes it easy to leverage the social networking power of your committed constituents by empowering them to quickly and easily share details about your organization and event with their friends and colleagues. 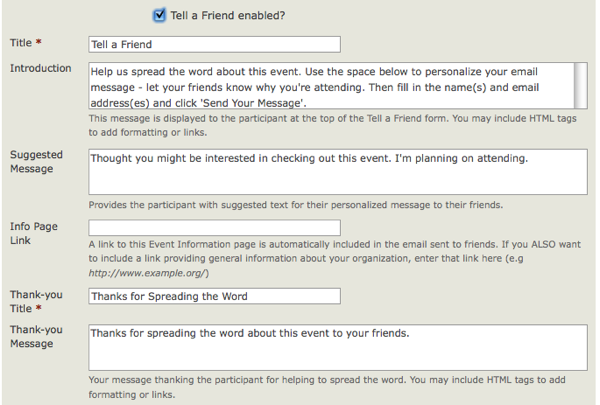 The final step in the event creation is a page where you can enable "Tell-A-Friend" capabilities. You can define the text and links to be included on that page and in the email sent from the tool (see the following screenshot). A "Tell a friend" activity record will be added to a participant's Activities tab each time she sends mail to her friends. This allows you to track your most active supporters and engage them further. The people who are emailed using this feature are also automatically added to CiviCRM as contacts. You can send automated confirmation and receipt emails to participants who register for an event, whether they register online or are registered by your staff or volunteers. The content and layout of these emails are controlled by message templates. Both HTML and Text formats are provided. You can modify or add text to these emails, or add branding such as a logo to the HTML versions. To set up a from email address from which to send the confirmation and receipts, see Set-Up in the Email section. 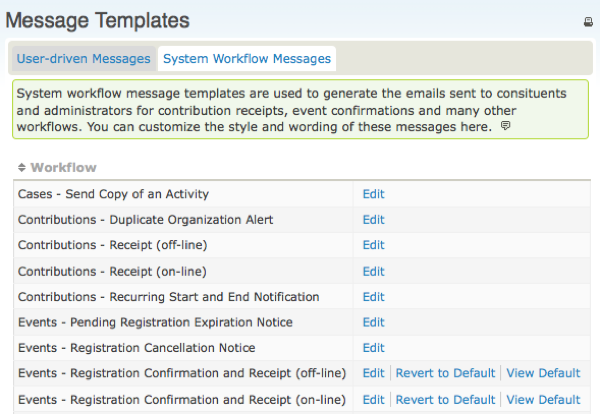 Navigate to Administer > Communications > Message Templates (shown in the following screenshot) and click the System Workflow Message tab to see the list of messages you can modify. 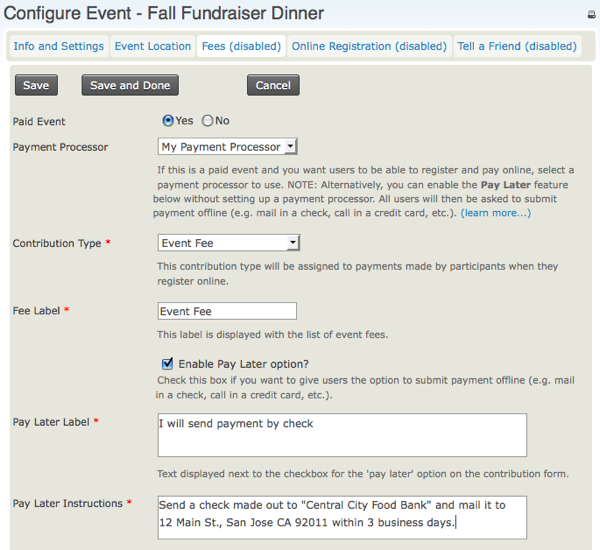 Click Edit next to "Events - Registration Confirmation and Receipt" rows to edit the content and layout. The templates for these messages include both the text shown and necessary program logic. Use caution when editing so as not to modify the program logic. Be sure to test the workflow and review the emails sent after making any changes. If you find that your changes have caused problems, errors or missing information, you can always revert to the system default for that workflow.